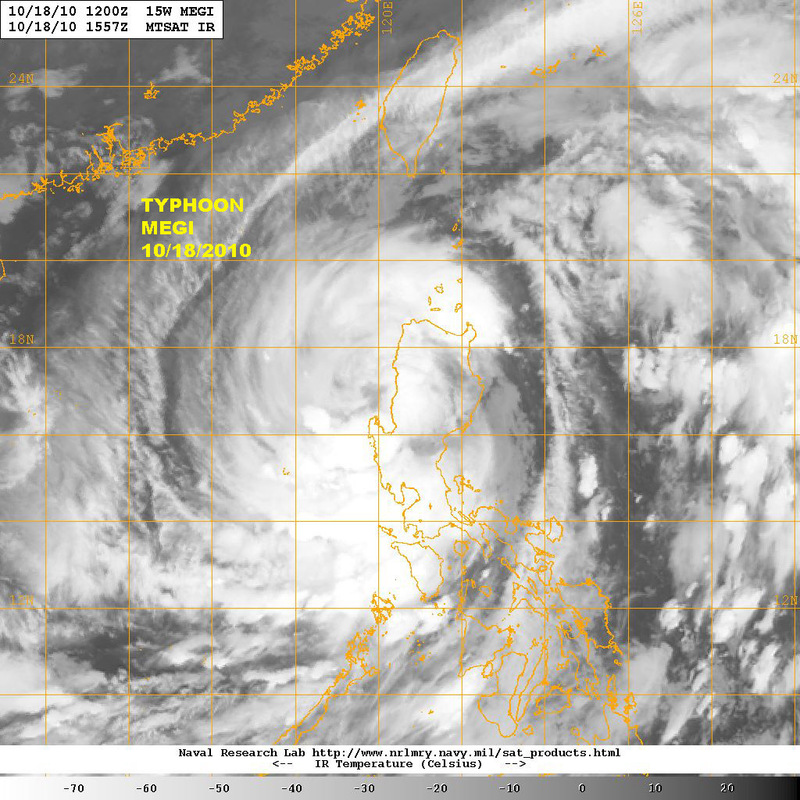 A Category 5 Typhoon (Hurricane) in the Western Pacific! Typhoon MEGI over the South China Sea moving toward Hong Kong as a category 3 tropical cyclone on 19 October 2010. Infrared filter satellite view of Typhoon MEGI on 18 October 2010 as it emerged over the South China Sea after having made landfall in the Philippines as a category 5 tropical cyclone the day before. 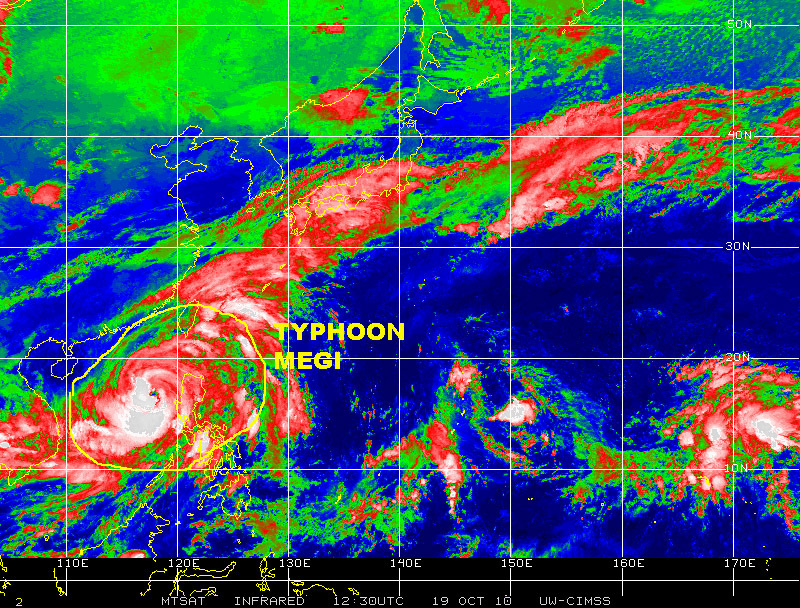 Typhoon MEGI, which reached category 5 strength a couple of days ago while over the Philippines Sea, in the western Pacific, made landfall in the island of Luzon, the Philippines, and is back to category 3 strength after emerging over the South China Sea aiming for Hong Kong and the mainland of China. This region of the western Pacific has been particularly active during 2010. 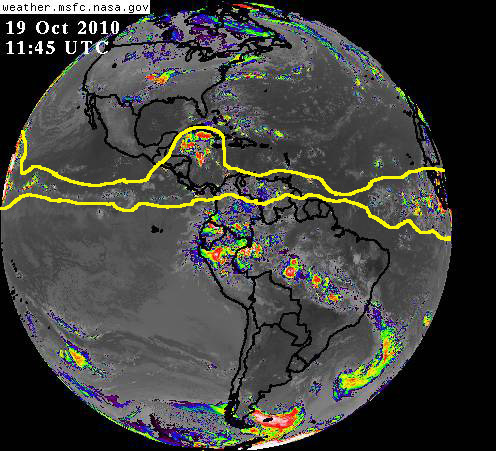 On the opposite side of the globe, the Caribbean near Central America continues to be quite active. Where just over one week ago tropical storm Paula formed off the coast of Nicaragua near cape Gracias a Dios, near the Nicaragua-Honduras border, we now have a large tropical wave with organized rain shower activity moving North-Northwest toward the Yucatan Chanel. 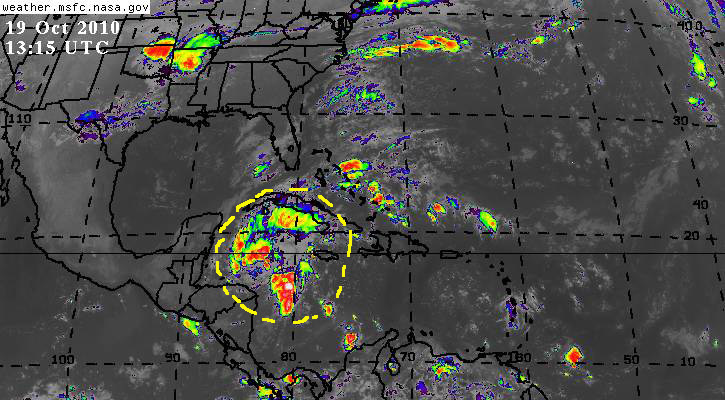 There appears to be a favorable environment ahead of this tropical wave making it possible that it might develop further over the next 24 – 48 hours, however this system may have to contend with a front descending toward the southeastern USA and the Gulf, which may affect its track just as Paula was affected a week ago. Color-enhanced infrared GOES satellite view of tropical wave in central Caribbean, near Cape 'Gracias a Dios' in Nicaragua, moving north by northwest toward the Yucatan Chanel in the same area traversed by tropical cyclone PAULA just one week ago. Looking toward the distant eastern Atlantic there are several small tropical waves riding along Hurricane alley and over Equatorial Africa. These waves appear to be smaller and weaker than those seen in August and September, and they are active closer to the equator, which takes them on a more southerly route than those in late summer. Regardless, it is important to monitor these weather systems as they make their way toward the Caribbean and the Antilles and get closer to our neck-of-the-woods. Composite of several satellite pictures creating a mosaic spanning from the eastern Pacific, through the Atlantic and equatorial Africa to the Indian Ocean on 19 October 2010. 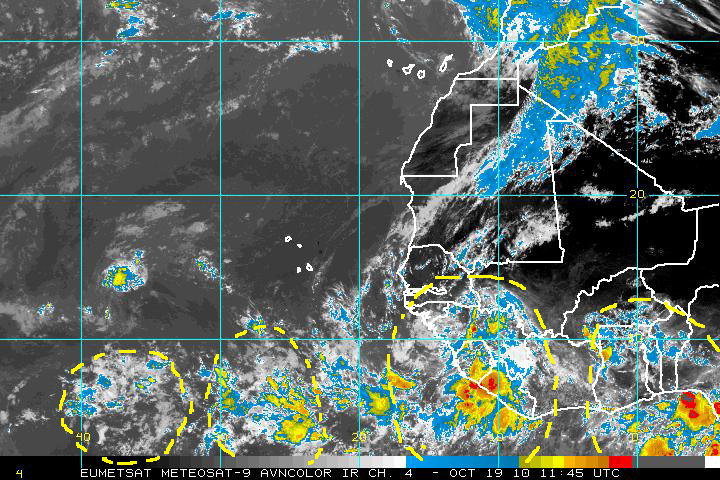 Several small tropical waves can be seen over tropical Africa and the Atlantic as they move westward. Full-disk satellite view of Earth's western hemisphere on 19 October 2010. The 'belt' of tropical activity has narrowed and shifted somewhat to the south as autumn takes over the northern hemisphere. Lots of storm and rain activity can be seen over Ecuador, southern Colombia and Venezuela, and over large regions of Brazil.